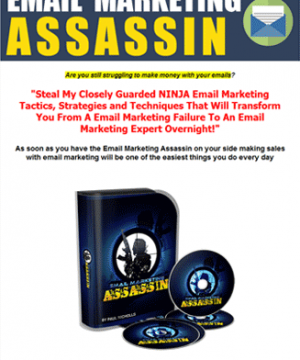 Grab your Share of the Email Marketing Nice with this Power List Building PLR Audio Package. Comes with private label rights. Resell and keep the Cash! Do we have a treat for you today. It’s a set of audio’s from one of the the best list builders on the internet. He’s been doing it for years and has it down to a science. You’ll be getting a brain dump and some of the best list building strategies you’ll find anywhere. Best yet this product is MP3 audio’s and who doesn’t have a device that players MP3’s these days? 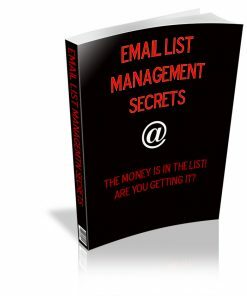 A format that is perfect for any one looking to learn the in’s and out’s of list building and email marketing. 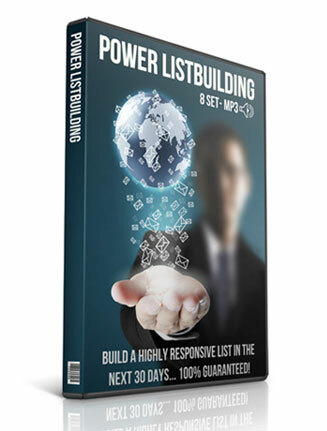 We’ve also created a brand new cover just for the Power List Building PLR package. You won’t find it anywhere else but here. You’ll even get the PSD for the cover so you can edit, brand or change it how ever you’d like. It also comes with rendered 3D covers in 5 different sizes, in ready-to-go JPG format. 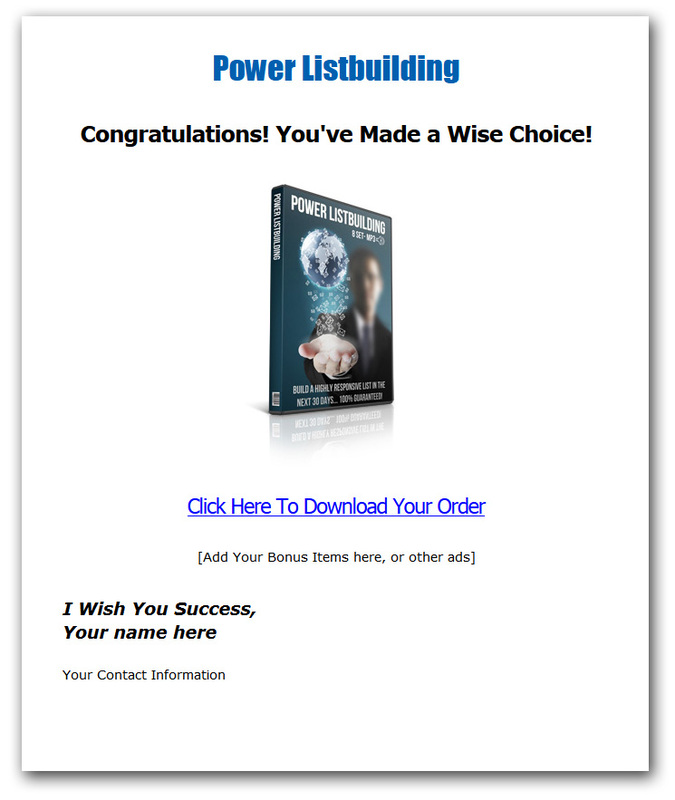 There is more… we also created a spanking new sales page and download page for the Power List Building PLR package. You’ll have the professional look that could help you sell plenty of copies. Here is your golden opportunity to cash in on a hugely popular niche with plenty of people searching for this exact information. It’s not the lame, rehashed stuff that many product of this market include, this is high quality content. You could sell it as a stand alone product and you keep 100% of every sale. Or use it to build a list. Would make a great addition to a membership site as well. If you are interested in radically increasing your list building results … then this is going to be the most exciting message you ever read. I have recorded an amazing new MP3 series called, “Power List Building” In this 8 MP3 series, I will just about everything you need to know about using some incredible, little known, techniques for supercharging your list building and getting many times your current results in the same time. 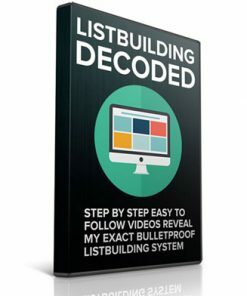 I start at the beginning, with step by step instructions and go through the entire list building process, from the beginning, all the way up to the most advanced techniques I use…giving you over 8 hours of complete list building instruction. Imagine being able to spend just one hour per day on your list building – and yet have several hundred new visitors to your web site each day. Wouldn’t that be great? Or what about if you could get others to build your list for you, instead of having to labor over it yourself? How would that feel if you could do this? Imagine being able earn anywhere from 50 cents to $2 per subscriber per month…every single month… It truly is possible, but you need to know how. That’s what this brand new MP3 series could help you to do. And it’s not like any other MP3 series you’ve ever listened to on radically increasing your list building results. Simply, every track on these MP3s is there because “you asked for it” or because it is vitally necessary for your growth and success in list building. Well, not “you” really. But from real live questions. Questions from people who love using my incredible, little known, techniques for supercharging your list building and getting many times your current results in the same time. My personal subscribers and coaching program clients have been literally begging me to reveal my closest secrets regarding list building, and how I consistently add thousands of subscribers per month … and in my brand new “Power List Building” I reveal it all, exactly the methods I use to gather subscribers fast, build a relationship with them, discover their online needs, and meet their needs quickly for the highest level of profit in your online business. I don’t drone on and on giving you useless info about how list building is ‘supposed’ to work’…or how it ‘can’ work…but I literally reveal every technique I use to supercharge my own list building. You’ll discover all types of exciting tips. How to write build your list faster than you have ever dreamed possible (I personally add as many as 150 new subscribers per day). 3 simple ways to use list building to generate massive publicity and traffic to your web site. The little-known way to create high-opt in rate squeeze pages, so that you are able to convert a high percentage of your visitors into high-paying subscribers – saving you hours of time and hundreds, maybe thousands of dollars. 5 proven steps to writing a highly persuasive, informative squeeze page that makes readers literally demand to be added to your list and get more information (or buy something) from you. 2 simple keys to use list building to generate traffic, both short term and long term (and why missing this critical distinction can literally kill your list building campaign). AMAZING! Discover in a matter of minutes how to multiply your subscribers by opting them into multiple lists…where in each list, they continue to make highly targeted purchases…because they are getting precisely the information they need to make purchasing decisions. 4 proven strategies for driving high-conversion rate traffic to your website…you are probably only using one of these strategies…I am using all 4…trust me, you need to be using all 4 of these strategies to maximize your list building traffic. 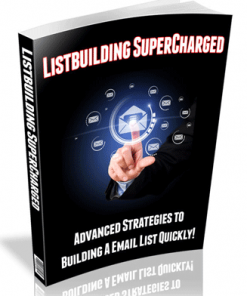 7 tips and tricks for supercharging your list building…including using other people’s traffic and other people’s list to build your list for you. A dirt-cheap way to find out exactly what your subscribers want to buy without spending an arm and a leg. 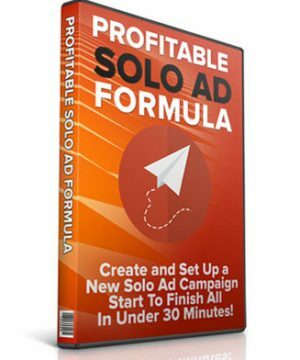 A free and easy way t o get additional subscribers from left-over traffic, so that you are not wasting hours or hundreds of dollars with your non-squeeze page traffic. Have you been looking for this for ages? Discover how to find get your emails opened with fervor – and how to get them to send you money fast. How to write seven different unique styles of emails, so that you can maximize the income you can earn from your online list – keeping more of the income for yourself, and giving less to the competitors. REVEALED! 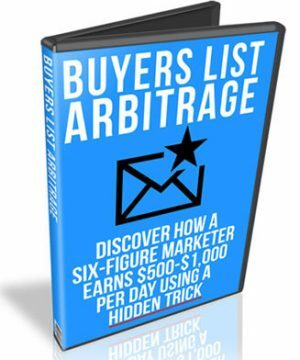 The hidden truth behind monetizing your back end….without this, you will probably never do better than breakeven on your list acquisition costs… I list each of them in ‘List Building Power List Building PLR MP3 Series’. Your secret weapon for testing and tracking that can instantly improve your revenue and profits by over 5 times. My private list of 15 traffic sources to use to generate online subscribers – and how to convert them for maximum income and profits. And that’s just a fraction of what you’ll find out in “Power List Building PLR” That’s why you should own these MP3s today. To have someone do all this research for you would normally cost you thousands of dollars ( I should know, I have spent far more than $40,000 learning everything I reveal in this MP3 series!). Particularly laser-guided accurate information like this – SPECIFICALLY for using some incredible, little known, techniques for supercharging your list building and getting many times your current results in the same time. . This isn’t some boiler-plate collection of answers. Everything is explained in PLAIN English. Which means it’s dead-easy to listen to and understand. And it’s logically laid out. As you know, I have not produced any MP3 or audio products like this. Most online marketers price these types of products at between $497 and $997 for the level of information I reveal in these MP3s (basically everything – everything I know and use about article marketing). 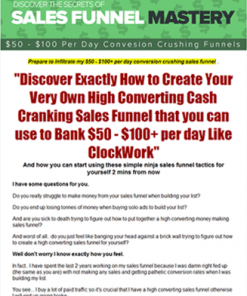 Keep in mind, I make over $15,347 per month, using list building as my primary conversion tool. And in this MP3 series, I reveal EXACTLY how I do it, and alot of the tactics behind my success. 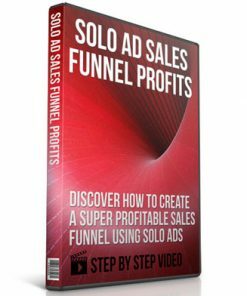 In the long run, I plan to add this Power List Building PLR product to my ‘sales funnel’ at $497, or maybe $997. This will eventually be one of my entry – level sales funnel products, and will be ‘mandatory listening’ for anyone who wants to gain access to my high ticket coaching products. But because you have been willing to help me record the series by attending the calls, I have decided to make this a no – brainer, and make the first 40 copies available to you, my loyal subscribers, for only $197 each. 8 + – MP3 series of the very information I use to generate the conversion activity I use to fuel my $15,000+ online income. That’s right, a fraction of what it’s really worth or what it cost me to research. Why would I make it so affordable? Simply because I want to make it affordable to you, my loyal subscriber. You have purchased my ebooks, you have applied my methods, patiently waiting for me to come up with a complete product – one that addresses every single list building issue you can dream of – and I want to reward you for your patience by practically giving this away (that’s right – once you factor in my time and the cost of producing the actual MP3s – including the cost of the physical bonuses – this is a real steal). The bottom line is I’ll be able to offer this fantastic resource of information (which if you follow the tips contained on these MP3s could really give you some amazing benefits) to more people. And make my investment back over time.